For 13 years Solid Gold Northland has started out the New Year by attending the Land O’ Lakes Kennel Club Dog show, and we are excited as always for this weekend’s coming show! January 6-8, 2012, first weekend of the New Year. What are you going to be doing? If you are in Minnesota, you will want to make sure you attend the 2012 Land O’Lakes Kennel Club Dog Show held at the Saint Paul River Centre. This is one of the largest all-breed dog shows in Minnesota. Events range from obedience and rally competitions, and there are over 155 breeds competing for “Best in Show”….that’s over 2,000 purebred dogs! AKC Canine Good Citizenship test will be offered, as well as Therapy Dog Testing. This is just to name a few of the events! You’ll also get the opportunity to visit over 70 vendors, who are offering all things canine. 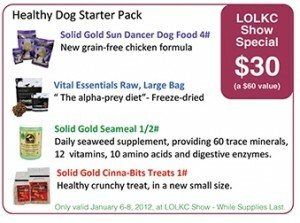 Be sure to stop by our booth, we are excited to offer a “Healthy Dog Show Special….Super, Super products at Super, Super prices”! These products are so wonderfully impactful to pets’ health we want to give everyone a low cost reason to try them for yourselves… you will see a difference in their pet! 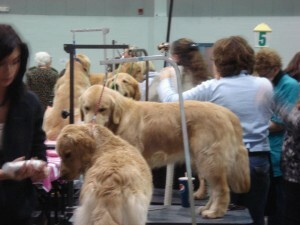 See you at the 2012 Land O’Lakes Kennel Club Dog Show!